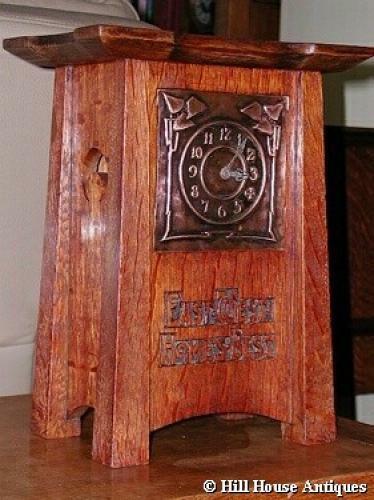 Liberty & Co (attributed) oak arts & crafts mantel clock with stylised copper panel to face in the Glasgow Style and carved motto to lower half of "East West Homes Best". Strong broad tapering columns feet in the Voysey style and bat wing crescent cut-outs to sides. Circa 1900. Approx 12" high. Base approx 8" wide and 5.5" deep.